Modern Motel With Swimming Pool! 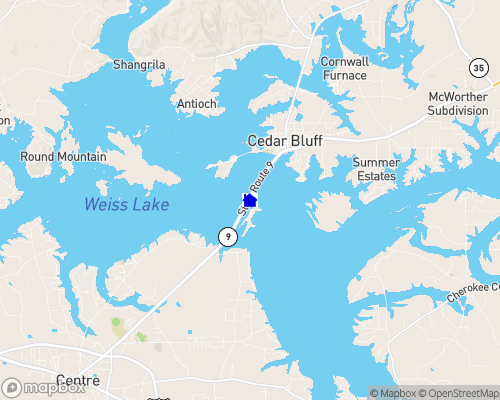 In Cherokee County, Alabama, near the cities of Cedar Bluff, Centre, Gaylesville, and Leesburg, hungry recreationalists looking for lake homes for sale will find Weiss Lake, a perfect spot for adventure on both land and sea. With water covering 30,200 acres, a lake level of 563.19 feet, and 455 miles of shoreline, exciting recreation is just a part of life on the lake. Owning lakefront property comes with ultimate access to recreational boating on Lake Weiss. The l ...Learn more here! Owning lakefront property comes with ultimate access to recreational boating on Lake Weiss. The lake is perfect for small and large watercraft alike, from kayaks, jon boats, and pontoon boats to ski boats, sport boats, and cabin cruisers. Weiss’s many bays and coves offer protection from the wind. No matter where your home on the lakefront is, it is likely accompanied by easy access to at least one of the lake’s eight marinas and at least ten boat ramps. Sailboats are particularly welcome on the lake. The Rome Sailing Club holds at least two racing series most months out of the year. If your ideal boat is a fishing boat, Lake Weiss is one of Alabama’s prime fishing destinations. According to the 2011 B.A.I.T. Program, which surveys fishing tournaments around the state, Weiss ranked fifth in the state for highest success rates. The lake is home to a variety of fish. As the local saying goes, Weiss is the “Crappie Capital of the World,” and it is gaining a reputation for largemouth and striped bass, too. Lake Weiss black bass average 15 to 18 inches long. Local fishermen participate in the 20 fishing tournaments that take place every year, and some have reported catching bass over five pounds. There is plenty to do on land and in the water. Duck hunters will find plenty of mallard, gadwall, and ring-necked ducks. Lake residents take advantage of the hiking trails, mountain bike trails, camping spots, and even the Indian artifact museum in nearby Cheaha State Park. At the foot of the Appalachian mountain range, the park contains the highest point in the state at which residents can look over beautiful natural landscapes from an observation tower. If golf is your activity of choice, the Cherokee Country Club features an eighteen-hole course a short distance away from the lake, near the town of Centre. From the longest tees, this 71-par course offers over 6000 yards of golf and has a 68.3 rating. For information about homes available on the course, go to GolfHomes.com. If you are hungry for high adventure in your own backyard, consider a house or cabin for sale right on the water of Lake Weiss. Boating, fishing, golfing, and other fun can be a part of your daily routine. Weiss Lake is known as the "Crappie Capital Of the World". Lake Weiss (pronounced "Wice") is an Alabama Power Company hydroelectric impoundment covering 30,200 acres in northeast Alabama on the Alabama -Georgia border. The Weiss lake fishery is the major economic influence in Cherokee County, so the locals treat anglers very well. Four free public access areas and 37 privately run marinas service Lake Weiss. Campgrounds, motels and rental cabins dot the shoreline of the lake. The lake known as the "Crappie Fishing Capital of the World". It is also home to the Weiss Dam. The dam was begun in 1958 and finished three years later. At full summer pool, Weiss Lake sits 564 feet (172 m) above sea level.